Workout in the morning before your holiday meal! Planning to go up for seconds and thirds on Thanksgiving? You might as well have all of that protein and those calories be put to good work! Speaking of going up for seconds….just don’t! After you’ve gotten your plate, enjoy the meal, but fight the urge to go back up for more. This will be easier done if you set your limits beforehand. Drink lots of water. Water will keep you hydrated, help flush your system, and keep you from calorie dense drinks such at soda and alcohol. Plan some fun activities. This could be anything from grabbing a few family members to go out for a run/walk/bike ride, or playing with the kids. Stay active, keep moving, and help to burn off some of those calories you just consumed! Maintain, not gain. Be realistic; the holidays are not a great time for losing weight. However, with a properly laid out plan, and some self control, you can at least avoid adding any weight during the holidays. Plan time during the week for exercise. If you are traveling, and might not have access to your usual gym or your trainer, write down your top five favorite exercises to do with the time and equipment you have available. Then, make time to do them! Don’t skip meals before holiday dinners. If you show up to Thanksgiving dinner starving, of course you’re going to over eat! IF you happen to overeat during one meal, balance it out by eating a bit lighter during the next one. Don’t worry about the actual holiday meal; it’s what you do between the holidays that count. Bring your own healthy dish. A few healthy food options can help to balance out the rest of the meal. Forewarned is forearmed. Remember, holidays come at the same time every year! Plus, if you’ve been working hard all year, giving yourself some time away from the gym isn’t such a bad thing. Sometimes to avoid burnout, we all need a break every once in a while. By the time we had only two weeks to go before the race, the number of would be Spartans began to drop. Between the intensity of the training, and the commitment required each week, only twelve brave Spartans were left to carry on. The weekend before, the team revisited the Spartan 1500 workout. Everyone stepped up, and destroyed their previous attempt. Huge props to Spartan Sarah Heeter who was the only one to complete the entire workout in less than 60 minutes! Before she started training for the Spartan, Sarah wasn’t able to run a mile without having to rest, and body weight pull-ups seemed impossible. Through lots of sweat, maybe even a few tears, and definitely a few cuss words, Sarah worked herself up to three solid body weight pull-ups, and she was running several miles with no rest. Go, Sarah! The Forteza Spartan Race team preparing for glory! Right before the race, things got even more challenging. Weather in Chicago can be fickle, and as it would happen, the temps dropped significantly the week leading up to the race. The Spartan Race is challenging as is; doing it in 30 degree weather with high winds makes it down right brutal! As if that wasn’t enough, team co-captain Keith, and the lively Mike Mauch, both had unplanned oral surgeries just days prior to the race. The pain, plus dehydration from the pain medication, added to the already considerable challenge. 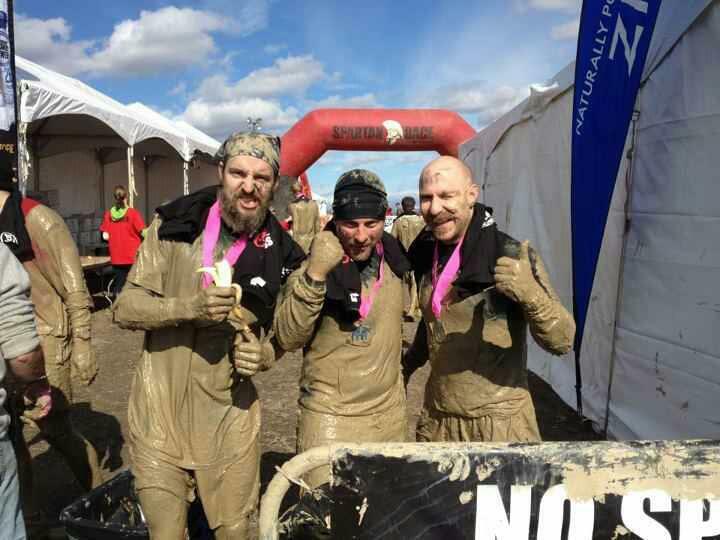 It was too late to back out, so the only thing left for Keith and Mike to do was Spartan up! They say the Spartan Race is the most challenging of all the mud runs, and the Midwest Spartan did its part to help make that case! The race started out to nearly two miles of hard running up and down rugged hills before the first significant obstacle. Once the obstacles appeared, they came with a vengeance. The obstacles were designed to punish the racers for the entire nine miles, with everything from army crawling under barbed wire, climbing various walls and obstructions, monkey bars that spin, dragging heavy sand bags and giant concrete slabs up and down hills, and of course, leaping over fire. The double dragons, Mike and Jessica, leap over a wall of fire. The most challenging of all was the swim through ice cold mud water out to a climbing rope, and then climb up to ring the bell. This one destroyed everyone, except for Spartans Joe and Vader who dug deep and powered their way to the top! In the end, everyone made it to the finish line. As the Spartan Race slogan goes, you really can’t know what an accomplishment finishing a Spartan Race is until the cross the finish line. Congrats to all of the Forteza Spartans! You are all truly warriors. The first three to make it across the finish line: Vader, Jordan, and Patrick. 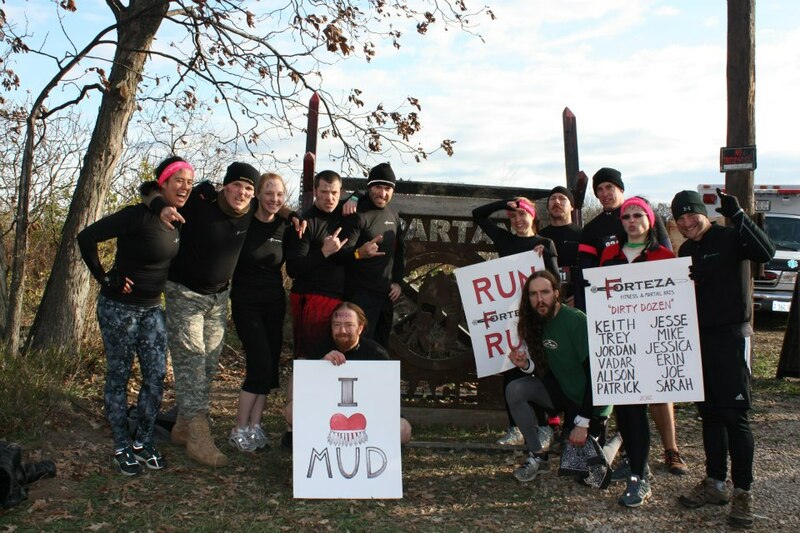 This past weekend was the Midwest Super Spartan Race, and team Forteza was out in force. The Super Spartan is an 8+ mile race (this year ended up being 9 miles) through grueling terrain, including plenty of hills, and of course an insane amount of mud. There were also close to 30 obstacles, ranging from rope climbing, to army crawling under barbwire, and swimming across an ice cold pool of grimy water. It’s no wonder that the Super Spartan only has a 69% completion rate! Forteza had twelve brave Spartans who signed up for the challenge. Team leaders Keith and Jesse had two Spartan runs under their belts, but for most of the team, this would be their first mud run. Some were seasoned athletes; others had never run more than a mile or two in their lives! However, no matter their original fitness level, everyone really stepped up their training in the month leading up to the Spartan. Alison, Erin, and Vader fighting hard to make it up the hill! Three weeks before the race, Jesse and Keith decided to put together a mini Spartan Race of their own. Lacking the required mud, they opted instead to challenge all of the Spartans by making everyone complete the course with kettlebells strapped to their backs! The guys had to take 35lbs bells; the ladies were allowed 25lbs or lighter. The run was a three mile course, with monkey bars, parallel bars, pull-ups, and more. All of which was done with the kettlebells strapped on their backs! After the last round of weighted hill sprints. In the spirit of crying in training so that we laugh in battle, the course ended with eight rounds of hill sprints. Having the extra weight made this a real challenge, but everyone dug deep and made it through all eight rounds. With only a couple weeks left before the race, it was time to put the finishing touches on the training regimen….. 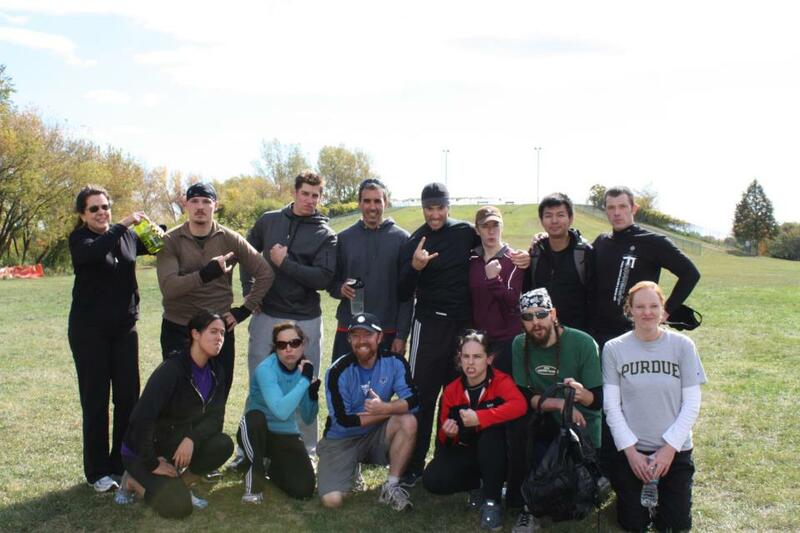 The Spartan team after a fun day of running, climbing, crawling, and hill sprints.